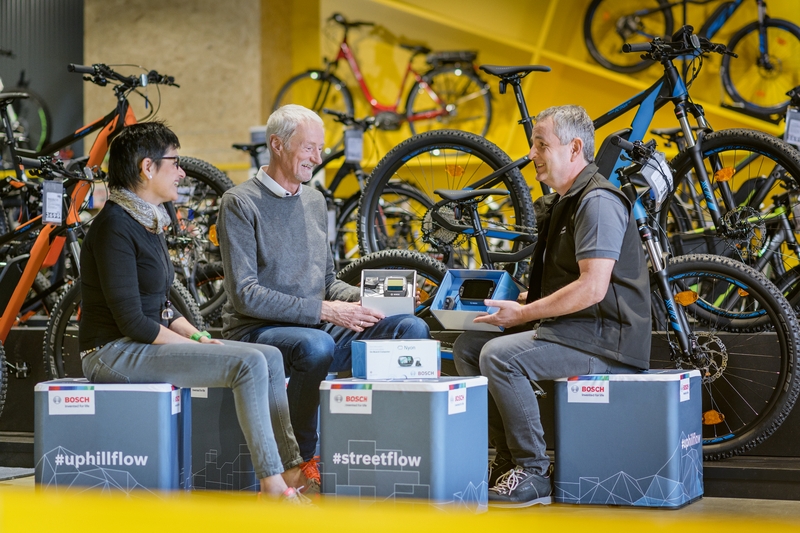 Stuttgart/Reutlingen – Good consulting and service are key factors in eBike purchases. A study conducted by fahrrad.de* makes clear: over 60 percent of survey respondents indicated that consulting and service are important decision-making criteria. 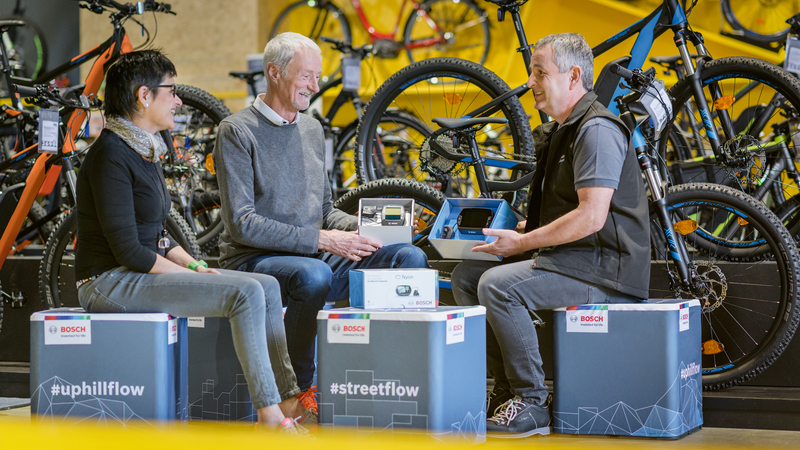 Bosch eBike Systems supports and trains bicycle and eBike dealers, enabling them to offer competent service and satisfactorily meet their customers' requirements. The training courses serve dealerships as preparation for the coming eBike season and meet with very positive response: over 10,000 participants joined the 2017/2018 training season – a new record. 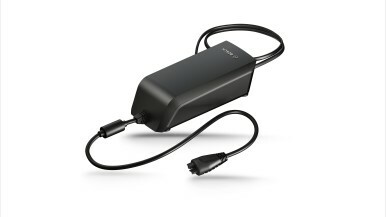 People considering the purchase of an eBike ask themselves numerous questions: Which drive is best suited to my needs? Which type of rechargeable battery and what battery power and capacity do I need? 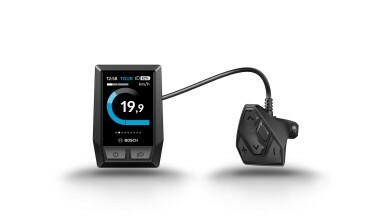 How does my eBike's control system work? And are eBikes subject to inspection? The trained bicycle dealer answers such questions professionally and individually. Moreover, potential buyers can usually get straight onto a bike and make a test ride in order to try out the various functions. Dealers are also an essential point of contact for after-sales service when maintenance, repairs and software updates are required. sessions covering the complete Bosch system are held every year in several European countries. Our expert consultants and Service Hotline are also readily available to provide dealers with the advice and help they need in their daily work." 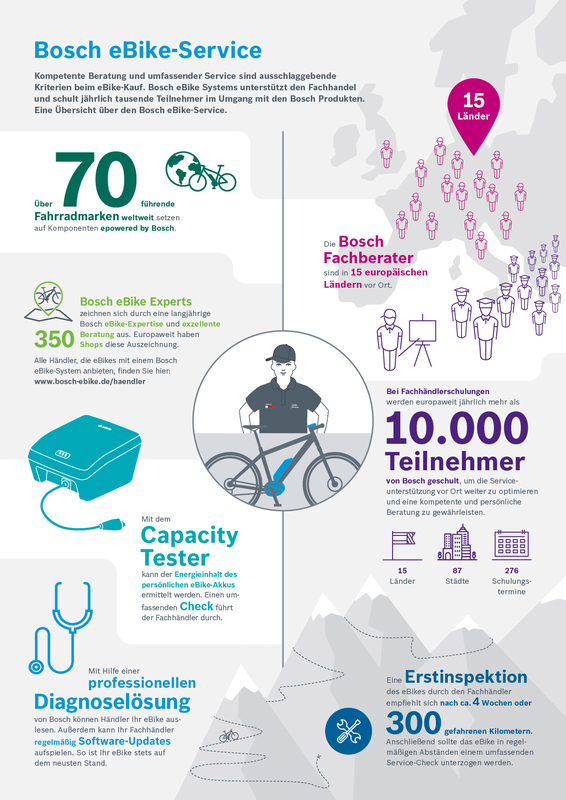 Over the course of our recently completed training tour we informed over 10,000 participants about the latest Bosch products and expanded their eBike knowledge. From October 2017 until March 2018, in total 276 training sessions were held in 87 different cities of 15 countries. Due to ever growing demand, we are continuously expanding the training schedule. For example, training courses were recently held for the first time in Scandinavia. Professional consulting and regular maintenance by an expert are necessary to ensure everything runs smoothly in the long term. 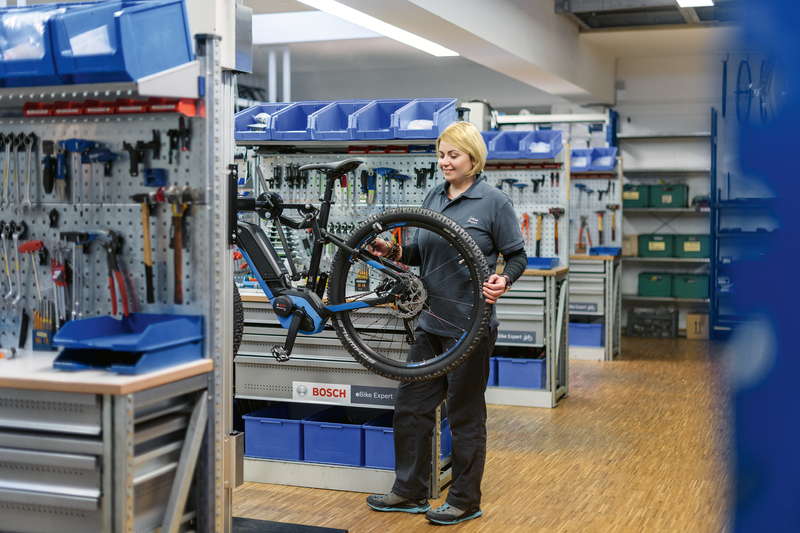 Bicycle dealers specialising in eBikes have tools from Bosch at their disposal enabling them to read out the system status and install software updates. This enables them to integrate technical innovations quickly and conveniently – such as the new riding mode specially designed for eMountain bikers. Bosch pursues a similar basic principle with its CapacityTester: should any eBike owner have the impression that battery performance is reduced or is considering buying a used pedelec, then it makes sense to check the battery capacity. The CapacityTester enables dealers to provide information on the battery's present energy content and the number of charging cycles performed. High-quality eBikes are designed for many tours, kilometres and years of service. However, even the most robustly built product may occasionally require repair or need components replaced. In such cases, it is recommended to have your eBike checked by a dealer. "To ensure safety and functional operability and, if necessary, assert warranty claims, we strongly advise eBike owners to refrain from repairing or modifying their drive systems themselves. Trained bicycle and eBike dealers have the specialised expertise and equipment. They can procure the suitable spare parts via the Bosch service partners and perform repairs and assembly quickly and reliably. This also applies to products available for retrofitting purposes," says Harttig. Dealers also provide support with the proper disposal of defective or old batteries. This is effected through the German GRS battery return system and ensures that valuable materials are returned to the raw material cycle, conserving resources. Bosch eBike Systems relies on an integrated product portfolio. 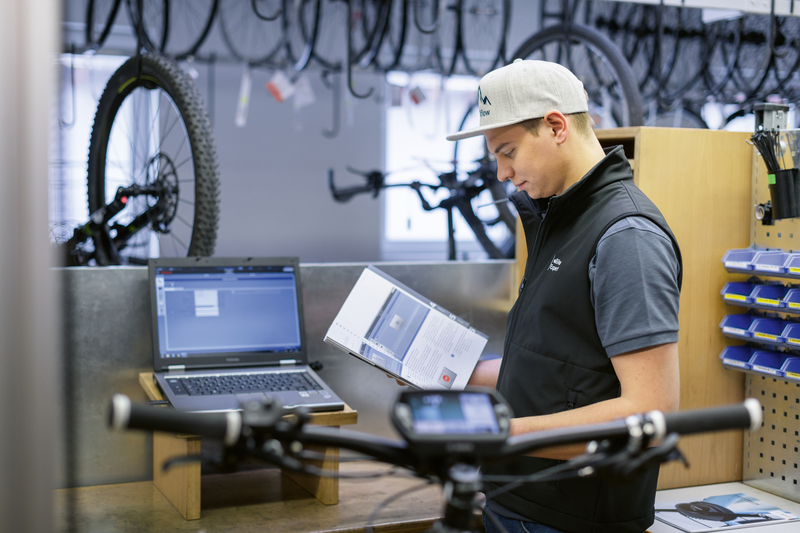 This means that customers – bicycle manufacturers and dealers – can procure everything from a single source, whether it's hardware, software, or comprehensive service: everything from the system itself, our website and online portal to providing diagnostic tools for reading out eBike status and installing software updates. Dealers can acquire spare parts and implement retrofits easily and conveniently by way of the online shop for service partners. 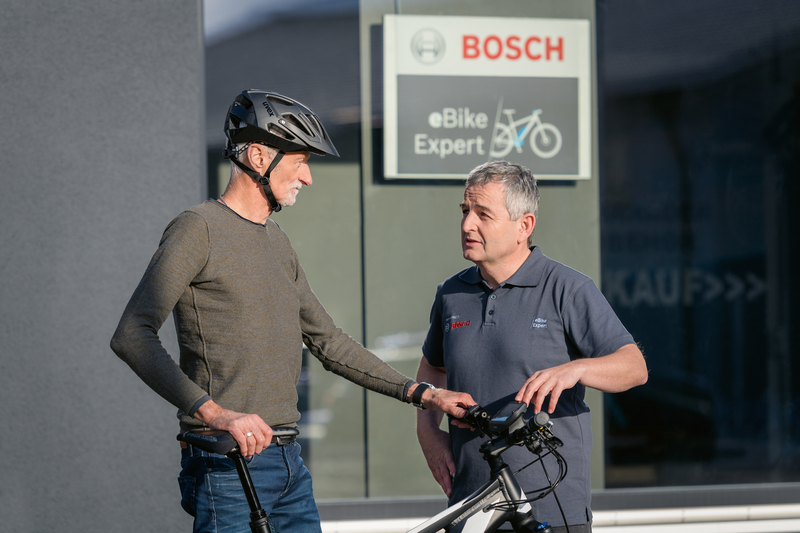 Bosch eBike Systems supports and trains bicycle and eBike dealers, enabling them to offer competent service. Training sessions are held every year in several European countries, in which dealers refresh and expand their knowledge of Bosch drive systems. Furthermore, Bosch's expert consultants and Service Hotline staff are available at any time to provide advice and support.